Summertime heat can aggravate eczema symptoms. While scientists have yet to develop a cure for eczema, there are many ways to mitigate discomfort throughout the summer months. Learn about lifestyle changes, medications, and other options to keep your eczema under control. Moisture is key in managing eczema symptoms, and taking a bath or shower can keep your skin moisturized. Avoid using harsh soaps or hard scrubbing, which can dry out skin and encourage eczema to flare up. You can add bleach, bath salts, oatmeal, vinegar, or baking soda to a bath to help keep eczema symptoms at bay. Different people respond differently to these ingredients, so you’ll need to experiment to find out what works for you. After bathing, apply a moisturizing gel or lotion to lock in the moisture. If you live in a dry climate, summertime can be especially harsh on your skin. 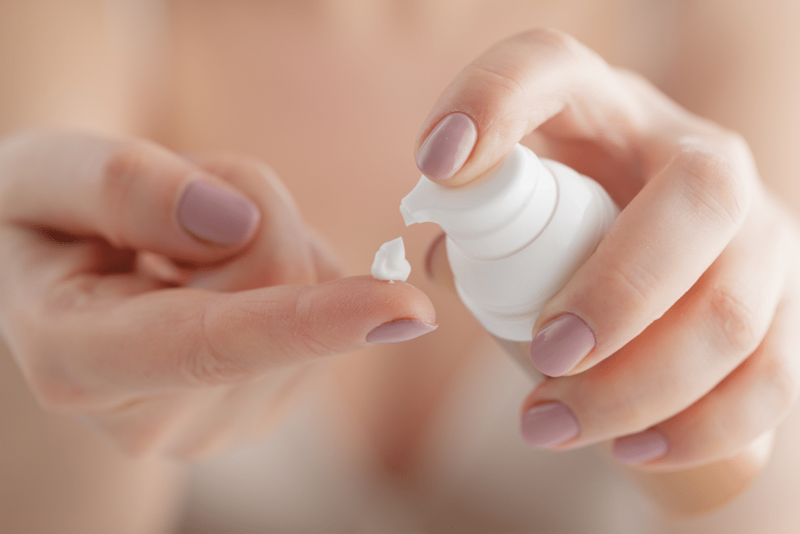 Keep gels, lotions, and creams on hand when you’re out and about, and moisturize after extended periods of activity. Some people with eczema report reduced symptoms during and after swimming in a chlorine-treated pool, while others experienced a flare-up in symptoms. If you are in the former group, you may enjoy a swim to escape the heat. Be sure to apply a generous amount of moisturizer before your swim and after your post-swim shower. Drinking plenty of water is key to managing eczema symptoms and replenishing moisture lost through sweat in the summer heat. Aim for at least eight glasses of water a day. The more active your lifestyle, the more water you’ll need. While moisturized skin can alleviate eczema, sweat can do the opposite. Whether you’re exercising, running errands, or simply enduring the summer heat, you’ll want to keep a towel and washcloth on hand to dry off and stay cool. Try to stay in the shade whenever possible, and minimize your time outdoors during peak heat. As for sunscreen, you’ll want to choose one that is gentle on your skin, preferably with the NEA Seal of Acceptance. Coupled with sweat, tight-fitting clothing can aggravate eczema symptoms. Wear loose-fitting, light clothing made from linen or cotton. Wear moisture-wicking tank tops or t-shirts while exercising. You can purchase OTC treatments targeted at reducing eczema symptoms. Products range from moisturizers, itch treatments, and skin cleansers. OTC treatments are accessible without a prescription. Your doctor or dermatologist can prescribe medications to ease your eczema. Common prescription topical medications for eczema include corticosteroids, topical calcineurin inhibitors (TCIs), and skin barrier creams. These medications are designed to mitigate itching, rashes, redness, and dry skin. If you have an especially persistent or severe case of eczema, your doctor may prescribe a system medication to keep your immune system under control. Biologic infusion is another option to manage your immune system. If you’re struggling with how to treat eczema, a licensed dermatologist in Los Angeles can help. Contact LDI today and Dr. Rispler will help you develop a personalized skin care routine for healthy, eczema-free skin all year round.